Every Aussie kid that grew up in a country town will tell you that the local Chinese restaurant was as exotic as eating out ever got. Mongolian Beef, so fancy. Chicken Chow Mein, oh la la. And behold the piece de resistance….the fried ice-cream ball…. Mind you everything pretty much tasted the same. Greasy, salty, and with a generous helping of MSG. Even as a kid I was pretty repulsed by all the suspect gelatinous sauces (seriously what on earth is that red crap they try to pass off as Sweet and Sour?) As you can imagine, I was a little traumatised by the whole thing and didn’t really think too kindly about Chinese cuisine until I actually escaped my little town and tried real Chinese food. I now feel that creating my own Paleo versions is part of my therapy. Oh, and if you’re ever passing through my town and you dine at the Fong Fong, don’t order a no.56. You’ve been warned. Preheat oven 200 degrees Celsius. Cut the tops off the eggplants, then cut into batons. Put the cut eggplant into one layer onto an oven tray, drizzle with the olive oil and sprinkle with a pinch or two of sea salt. Bake for 30 minutes, flipping halfway through. While they are cooking, heat the sesame oil on a medium-low heat. Add the ginger, garlic, onions and chilli flakes, softening everything, but not frying (reserve a few of the onions to garnish finished dish). Turn heat down to low and add the coconut aminos and coconut sugar and stir in, dissolving sugar. Remove from heat. Add the cooked eggplant to the sauce, turning the batons gently to coat them all in sauce. Serve warm sprinkled with the sesame seeds and green onion. 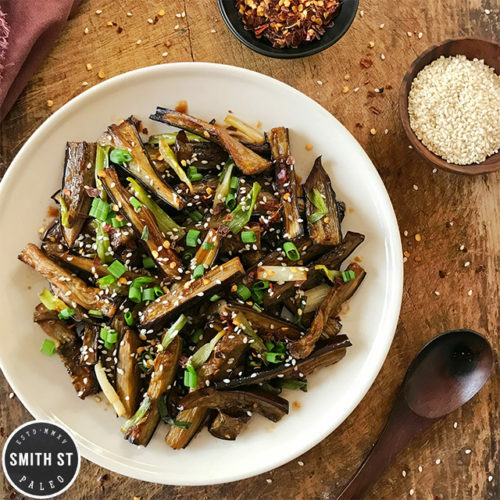 Hello,I check your blog named “Sweet & Spicy Chinese Eggplant – Smith St Paleo” daily.Your story-telling style is witty, keep it up! And you can look our website about daily proxy.